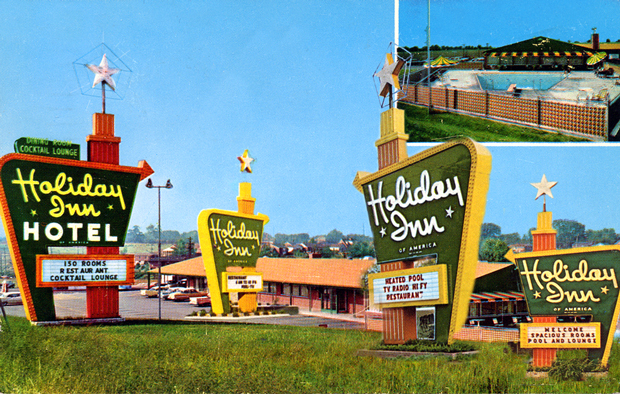 As Holiday Inn revamps its visual identity, Sean Adams laments the loss of its grand roadside signs. I realize that progress means change. This keeps the world from being a museum trapped in time, and I’m all for progress. But somehow, the world has found good taste, and that’s not nearly as fun as loud and gaudy. Holiday Inn, for example, has a nice and upscale new contemporary attitude after redesigning their logo (as well as their hotels) last year. This makes for a nice road trip experience with nice and tasteful signs politely dotting the freeways. However, when it’s late and I’m tired I want to see a giant sign with a huge arrow. Like a hero in a Greek epic poem, I want a bright shining beacon pointing the way home. 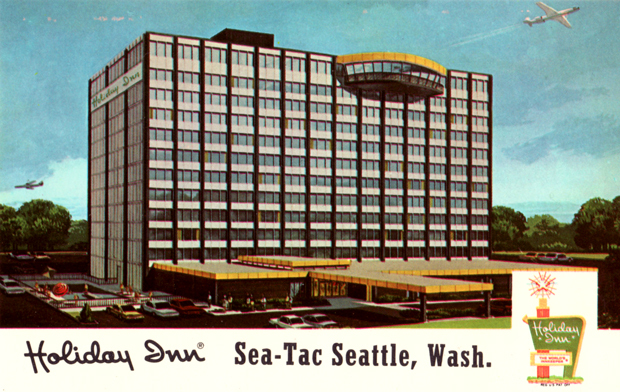 Kemmons Wilson opened the first Holiday Inn in 1952. He had spent too many evenings on road trips with his family pre-screening motels with dirty bathrooms and stained sheets. So he designed an experience that was consistent from Winnemucca to Wisconsin. 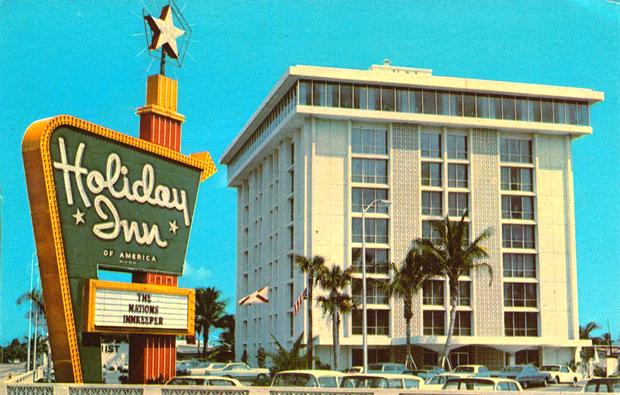 The giant sign became the company’s most recognizable asset. It even took the place of the simple script logo on postcards. It wasn’t just the design of the sign that maintained unity. The guest knew that the same clean bedspread was in each hotel; there would be two glasses, and a coffee shop for breakfast. Now some people may think consistency is the hobgoblin of small minds, but it works well when Norman Bates’ Psycho motel is on one side of the road, and a bright Holiday Inn sign is on the other. 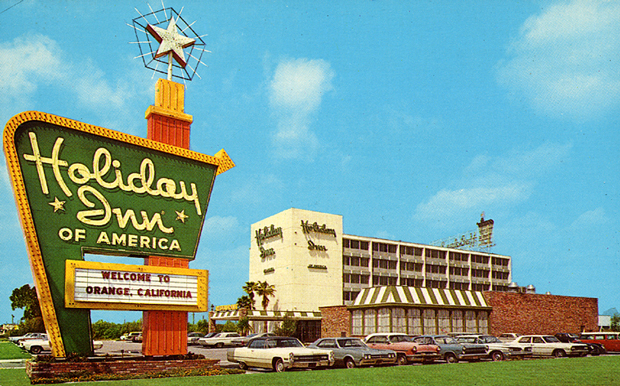 I think it’s time to pull those big flashing Holiday Inn signs out again and put them on the side of our freeways. I’ve seen enough tasteful small signs carved in wood with small refined logos and delicate spotlights. president ex-officio of AIGA. He is the co-author of Logo Design Workbook, Color Design Workbook, and the book series Masters of Design.